Instant lifting in the face and eyes. Lifting serum SIENNA significantly smoothes the skin from the first application. Without the effect of mask and immobilization facial expressions. 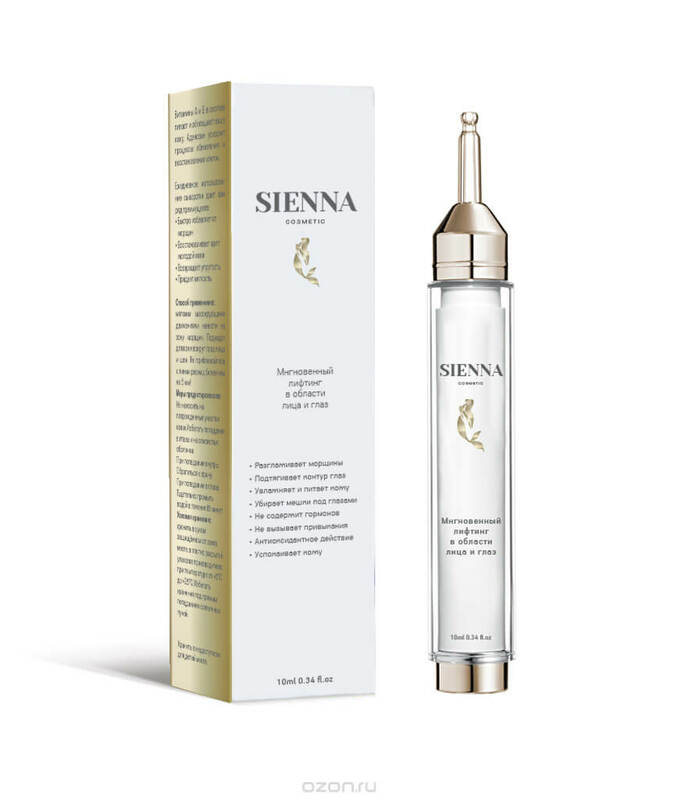 SIENNA intensively moisturizes the delicate skin around the eyes. Thanks to the combination of SYNAKE® peptides, JANIA RUBENS EXTRACT® and hyaluronic acid, the maximum result is achieved in a short time and is permanently fixed in course use. The unique composition promotes instant penetration into the skin and starts to work immediately, it affects the muscles of the face, stimulating the regenerative processes in the skin. The biosaccharide resin gives the skin tenderness, silkiness without the effect of oiliness. Provides instant and lasting moisturizing effect. Polyglutamic acid reduces the effects of water loss. Increases the level of the natural moisturizing factor. Soothes sensitive skin. Vitamins A and E in the diet nourish and enrich your skin. Adenosine accelerates the processes of cell renewal and recovery. Method of application: Apply soft massaging movements to the wrinkle zone. Suitable for the skin around the eyes, face and neck. Do not approach the eyelash line more than 5 mm! Special precautions: If swallowed, seek medical advice and, after contact with eyes, rinse thoroughly with water for 15 minutes. Storage conditions: Store in a dry place protected from light, in a tightly closed container of the manufacturer, at a temperature of + 5 ° C to + 25 ° C. Avoid storage under direct sunlight. Keep out of the reach of children. Serum does not contain: parabens, sulphates, phthalates, steroids, mineral oils, benzophenone, triethanolamine and artificial dyes.